President Obama used a Labor Day event to tout economic gains and chide Republicans for not joining him in promoting policies he says will help working Americans, his latest push on a campaign-year issues that Democrats hope will boost their support at the polls this fall. 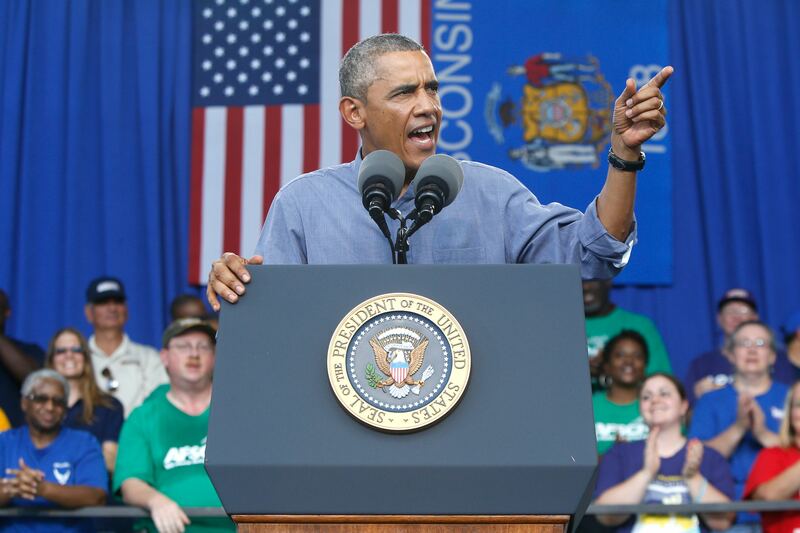 Mr. Obama traveled to Milwaukee, Wisconsin Monday to speak at Laborfest, an event he visited in 2008 during his first presidential campaign. Despite a host of foreign crises he has faced all summer, the president's focus was on domestic news, which is decidedly less gloomy. "I've got a vision of an economy where opportunity is open to everybody who's willing to work hard," the president said. "I want an economy where your hard work pays off with higher wages and higher incomes and fair pay for women and workplace flexibility for parents and affordable health insurance and decent retirement benefits. I'm not asking for the moon! I just want a good deal for American workers. "...If we had a Congress that cared about policies that actually helped working people, I promise you we could get everything done that we talked about doing," he added. "But until we have that Congress its up to us to fight for those policies." Mr. Obama highlighted the addition of 10 million new jobs in the past 53 months, including six straight months of growth with more than 200,000 per month - the first time since 1997 that has happened. He will also point to a 6.2 percent unemployment rate, which is down 1.1 percent from last year with significant gains among the long-term unemployed. "We got struggles, we got work to do, but there are a lot of reasons to be optimistic about America," the president said. "You wouldn't always know it from watching the news. By almost every measure the American economy and American workers are better off than when I took office." He joked that "every gray hair is worth it" in the fight for those gains. The picture isn't entirely as rosy as the White House paints it to be. A Pew Research analysis concludes that the rate of "underemployment" - people who want to work but haven't job-hunted recently and those who work part-time for economic reasons, not by choice - was 12.2 percent in July. Underemployment has dropped to the point that it is near the high end of what it used to be before the recession began, but it still remains higher than it has been at any point since 1994, when it was first measured. Pew says the biggest contributing factor has been a major increase in the number of part-time workers that has been slow to fall: 7.7 million as of July, which is 3.3 million more people who work part-time for economic reasons than there were before the recession began. In particular, Mr. Obama pushed for an increase in the minimum wage, which has been a persistent focus all year as Democrats align their focus with pocketbook issues ahead of what is expected to be a tough midterm election. In February, the president signed an executive order requiring federal contractors to pay their employees at least $10.10 per hour, one of several executive steps he has taken this year in a show of effort to tackle issues he says Congress is ignoring. "There is no denying a simple truth: America deserves a raise," he said. "Folks are doing very well on Wall Street, they're doing very well in the corporate board rooms. Give America a raise. And I think eventually Congress is going to hear them." Mr. Obama will focus Monday on the minimum wage, which has been a persistent focus all year as Democrats align their focus with pocketbook issues ahead of what is expected to be a tough midterm election. In February, the president signed an executive order requiring federal contractors to pay their employees at least $10.10 per hour, one of several executive steps he has taken this year in a show of effort to tackle issues he says Congress is ignoring. A companion bill from Senate Democrats that would have raised federal minimum wage by the same amount was blocked by Republicans in April. The current minimum wage is $7.25 per hour. "I know it gets frustrating, though, when it feels like your voices aren't heard in Washington. I promise you, I share that frustration," the president said, a nod to his frequent battles with Congress. Mr. Obama also used his weekly address over Labor Day Weekend to focus on the minimum wage, saying that states and private sector employers should raise their hourly pay without waiting for Congress. "There are reasons to be optimistic about where we're headed, and the decisions we make now will determine whether or not we accelerate the progress," he said. And the way to grow the American middle class, he went on, is "not by making sure a fortunate few at the top are doing well, but by making sure that everyone who's willing to work hard and play by the rules can get ahead." He praised states and private companies like the Gap, which moved to raise the minimum wage without any government mandate. He also had praise for unions, which he said helped win gains like the 40-hour workweek and weekends for workers.